Stay oil-free & matte all day with IT Cosmetics’ latest CC Cream! It seemed that we started the year complaining about the bitter cold, and now it’s swung to extreme heat in the northern hemisphere. Down here in Singapore, we are running at a toasty 34-degrees celcius, but it has been alternating between random thunderstorms and blazing sun. Between running in and out of dehydrating air-conditioned interiors and squeezing in lunchtime barre workout sessions, I’ve had to find skin-friendly means of keeping my foundation intact all day. And my most recent secret weapon is the brand new Your Skin But Better CC+ Cream Oil-Free Matte from It Cosmetics! The teal packaging sets the new Oil-free Matte formula apart from the original Your Skin But Better CC+ Cream. But the pump dispenser and style of packaging, right down to the creamy texture of the product, are similar to its predecessor. It is easy to blend with either fingers or brush, though I personally prefer using a dampened sponge. Coverage straight out of the tube is a good medium to full, and easily thinned out to a lighter coverage as desired. The Oil-free Matte CC+ Cream evens out skin tone, and conceals my dark circles and any redness sufficiently, but major zits will still require a separate concealer. Because I’ve been having some redness on my skin lately, I decided to do a full before / after comparison for you to see the effects of this CC. 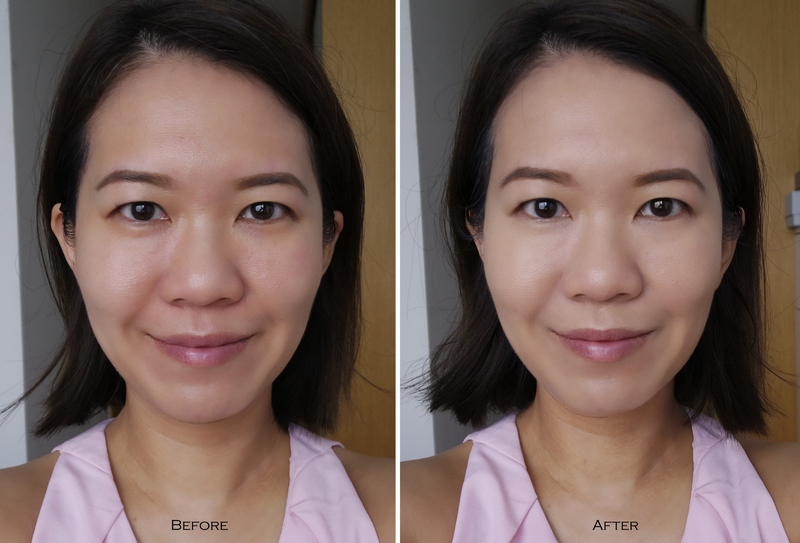 As you can see, the It Cosmetics’ Oil-Free Matte CC+ Cream is able to even out my skin tone and even most of my dark circles. It leaves a velvety finish that is matte without being flat. Depending on the level of oiliness your skin experiences, you may wish to add a mattifying primer on your t-zone and dust off with powder at the end to seal it all in. On my skin, if worn on its own, the It Cosmetics Oil-Free Matte CC+ Cream lasts through the day (lunchtime barre workouts included) without fading or oxidizing. I do get a little bit shiny, especially around the t-zone, if I have been sweating particularly much, but a simple blot will set things right again easily. There are several shades available, and I have swatched 6 of them here for your easy reference. I am wearing shade Light in the comparison shot above, and it is a good match for my roughly NC25 skin tone. This Oil-free Matte version has an excellent SPF40 UVA/UVB broad spectrum sun protection formulated with physical blockers, just the way I like it. It is slightly lower than the SPF50 rating on the original CC+ Cream, but I am hard pressed to find any other base makeup with anything close to SPF40. On the other hand, the lowered SPF seems to have rendered this Oil-free Matte CC+ slightly lighter and smoother than the original, which I really appreciate. The new It Cosmetics Your Skin But Better CC+ Cream Oil-Free Matte is already out in the US, and will be arriving in Sephora Singapore later this month! Will you be trying it out? These Babies will see you Glowing all through Summer to Fall!